We have tested a lot of daily contact lenses over the years, but we can genuinely say that our NEW Crystal Aqua Daily is the best of them. This daily contact lens has Hyaluronic mosturising agent embedded in its core, which acts as powerful wetting agent - giving you great comfort from the moment it is put in, to the time you take it out. This daily lens is superb for dry eyes and our in house trials often came back with the comment that this is the first contact lens that cannot be felt in the eye. Each box contains 30 soft contact lenses each with a light blue handling tint in a buffered saline solution containing phosphate with Hyaluronic acid. I have been wearing daily disposable contact lenses for over 20 years. 1 day Acuvue were the first brand that I used prescribed by my optician. Then I found this company contactlenses.co.uk and started buying my contact lenses here more than 10 years ago. I've since tried a few of their cheaper brands of contact lenses. CRYSTAL AQUA DAILY are my favourite and rival any more expensive brand! Great lenses - shame about the new packaging. I received these lenses last week. Shipping time was about a week to the US, not too bad. I have a slight astigmatism in my right eye but not enough to have to use a toric lens. These lenses are slightly bigger than what I usually use. Oddly enough though, these lenses felt really good in my right eye but my left eye felt like something was scratching my eye and after giving these lenses 3 days for my eye to get used to, my left eye was red and irritated. I contacted customer service and they didn’t hesitate to refund my money. 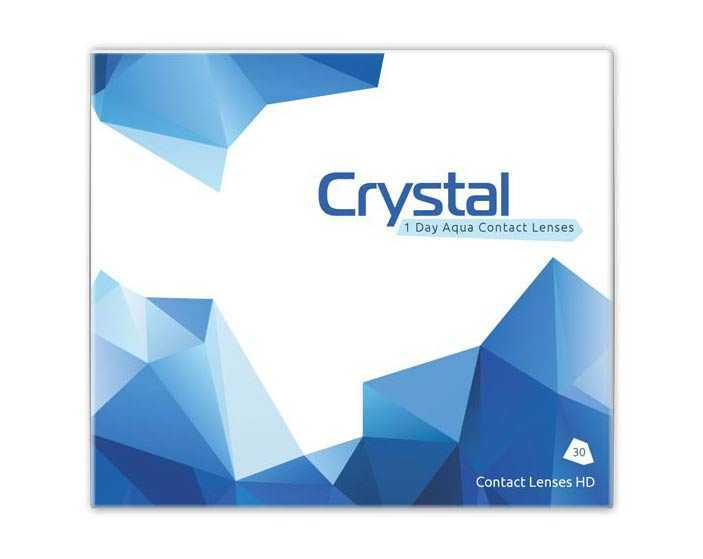 I’ve ordered the Crystal monthly lenses and may try the Crystal One days. These lenses feel awesome on my right eye though (my dry eye and one with the astigmatism). Excellent alternative, at half the cost! I rarely, if ever, leave reviews - but to be quite honest, I'm pretty blown away by these lenses. For years I've used "branded" moist lenses, they were always okay, some days better than others, as my eyes are quite sensitive and problematic. Anyway, on a whim I tried these - and crikey, they're great! I actually find them more comfortable, and my vision clearer, than the much more expensive premium brand. All i can suggest is, if in any doubt, and for the price, give them a go! I certainly have no regrets, and can only highly recommend.. They are a great price but it’s a shame they irritate my eyes. I haven’t had a day where both were fine, at least one of my eyes has been irritated (feels like scratching). More worrying is the that on two occasions I have just touched my eyelid due to irritation and the lense has came out my eye. Apologies, your power () is out of stock. We apologise, but the selected power(s) that you have chosen are out of stock, so delivery could take up to 30 days. If you proceed with the order, we will replace Crystal Aqua Daily with Soflens Daily Disposables, which is a very similar lens, at no extra charge. Please contact Customer Support if you require any further assistance.